You will be given a Free reference e-book to read which has 312 pages And the test will be based on that e-book. IBM Advanced Interactive Executive (AIX) refers to a collection of proprietary and valuable operating systems based on UNIX and are established and offered by IBM for a number of computer platforms. One of the many things that make IBM AIX impressive is its ability to support numerous hardware platforms such as the popular IBM RS/6000 series, IBM POWER and systems that are primarily based on PowerPC. It is also capable of supporting IBM system i, PS/2 PCs, the network server of Apple and the mainframes for System/370. But because of the powerful nature and the many capabilities of IBM AIX, an aspiring user of it is required to learn more about the basics of improving its performance and system tuning. IBM AIX performance and system tuning actually requires a strong knowledge about how the entire system works as well as its major components. This will enable you to easily detect problems from any of the proprietary UNIX-based OS that form part of its series. Fortunately, your chances of learning more about all aspects related to improving the performance and system tuning of IBM AIX are increased with the presence of the free IBM AIX performance and system tuning practice course developed by Brainmeasures. As one of the most reliable online certification provider at present, you have a hundred percent guarantee that the free study guide and practice test that are included in the course are capable of providing you with highly accurate information. The free IBM AIX performance and system tuning certification practice course provided by Brainmeasures aims to provide the most comprehensive and detailed information about how to boost the performance of IBM AIX. This free IBM AIX performance and system tuning practice course can help you understand the most relevant concepts and aspects related to running IBM AIX as well as the methods, tools and techniques that you can use to instantly detect problems in its series of operating systems and fix them right away. You will get the chance to maximize your knowledge about IBM AIX with the detailed, updated and highly accurate study guide which is also offered by Brainmeasures for free. The good thing about this free practice course is that it also comes with a free practice test which is capable of giving you a clearer idea about how the actual IBM AIX performance and system tuning certification test really takes place. This works in optimizing your chances of receiving a certificate in the field which proves your proficiency. How to effectively detect errors in the system and correct them right away? 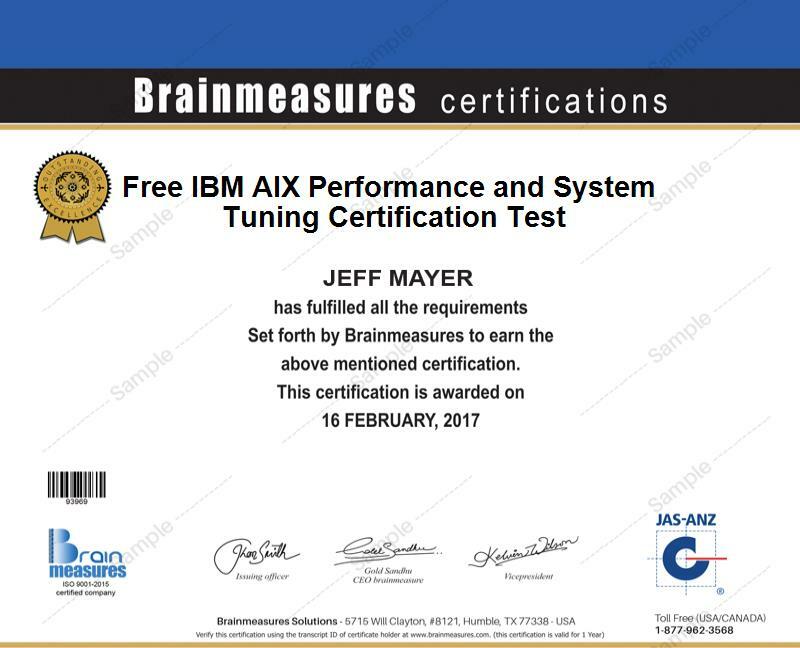 The free IBM AIX performance and system tuning practice course offered by Brainmeasures can benefit anyone who wants to pass the certification exam and finally receive a certificate in this field. This certification course aims to benefit all aspiring and practice IBM AIX technicians, analysts, engineers, consultants, managers and anyone who is more concerned about analyzing the performance of systems and improve it. Passing the actual IBM AIX performance and system tuning certification exam is also a major help in increasing your salary. Your certificate is valuable in getting the position of an IBM AIX technician which usually offers an average annual salary of $79,000. You will also earn an average annual income of $91,000 if you decide to work as an IBM AIX performance analyst.